Cookie dough is to Ben & Jerry’s fans as buried treasure is to pirates. Thankfully, the ice cream giant has released a selection that is straight-up filled with these gems to save you the effort of combing through pints. If you’re one of the many who think that the cookie dough bits are the best part of Ben & Jerry’s ice cream, you might agree that there’s a flaw in its product range. There’ll be days when you just feel like having the chunks, but you know that you’ll be left with a weird cookie-dough-to-ice-cream ratio the next time around. Now, Ben & Jerry’s has unveiled packs of ‘Snackable Cookie Dough Chunks’—yes, just the raw cookie pieces—so you can savor them without removing any from your ice cream. If you’re feeling extra indulgent, you can even pepper more morsels over your dessert. The new additions are available in chocolate chip and peanut butter chocolate chip flavors, and are best eaten frozen. 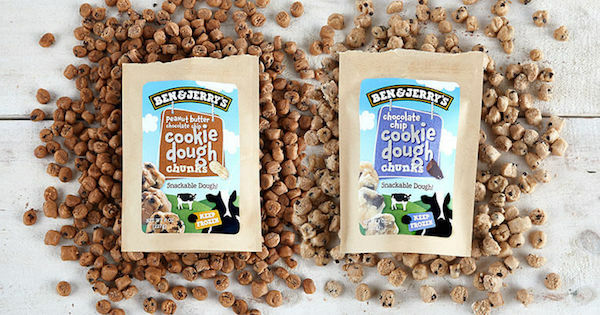 For now, the brand is just experimenting with this variety, so the cookie dough packs are only available in Vermont, the home state of Ben & Jerry’s. If they’re wildly approved by fans in the area, the company might launch a nationwide rollout. Batter scarf these down, Vermonters.